Thanks Rich. BP's can fade pretty good with age, and she was quite bright and glowing as a youngster, with more white on her also. However, she's still pretty stunning now, it just depends more on the light, and it's more subtle. 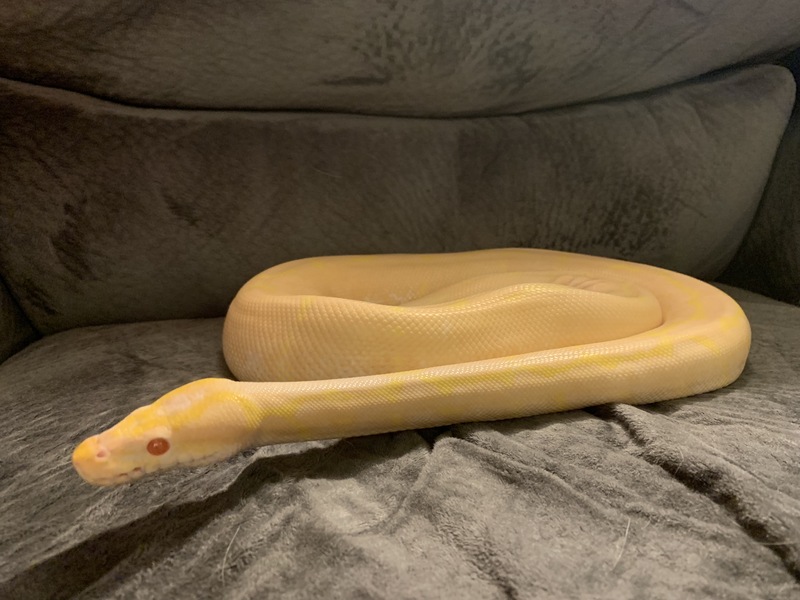 However, if she shed recently, or is having a good day, and you catch that "spider" pattern right, she absolutely glows. Katie says it looks like someone drew on her with a yellow hi-lite pen! Her heard, especially, has retained much of that neon brightness. As you know, I'm loving my Boas, and Yafe, my Carpet Python, is growing on me. 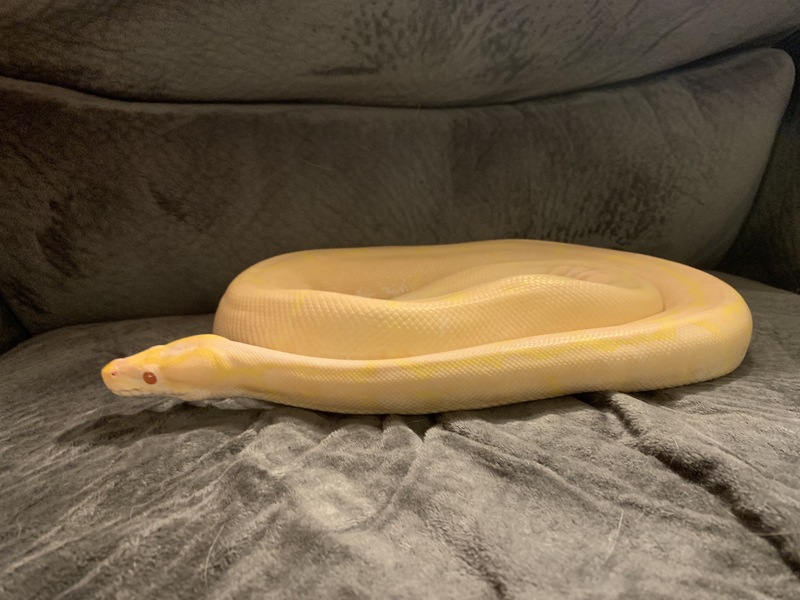 However, I've always had a BP in the collection and a BP was my first snake (corn snake second - and yes I love Figment and Solana as well - but I've had corns for almost as long as BP's). What Shayna lacks in inquisitiveness, she makes up for in beauty, gentleness, and for getting me back into reptile keeping in a big way 6 years ago. I guess you could say she was my gateway snake; BP's always have been. I've always enjoyed them and they felt safe to me. 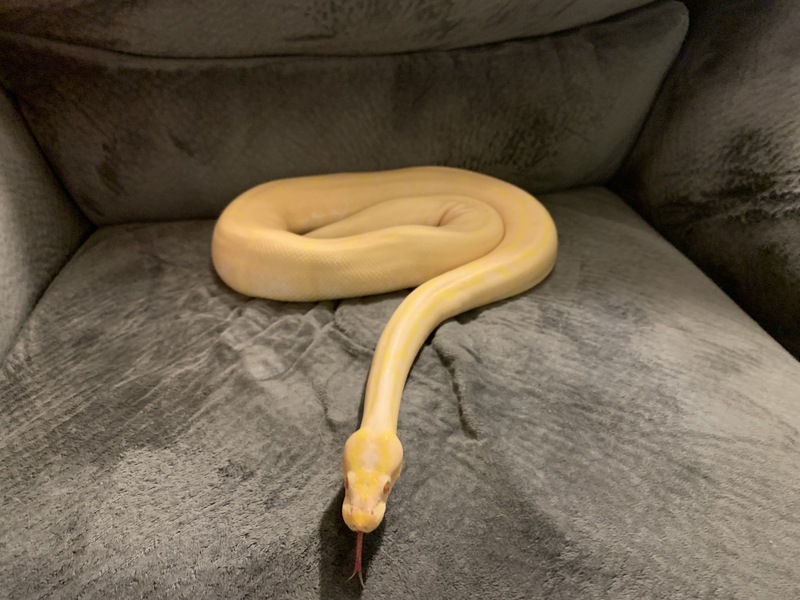 Shayna was such a great snake (and I already had George at the time - bearded dragon who made it to 11 before having to be put down - RIP) that she inspired me and gave me the confidence to try keeping other species. I wouldn't have Behira, Feliz, and Yafe, if not for Shayna. Shayna will always have a special place in my heart. Shayna doesn't come out much during the winter because she's pretty inactive and mostly brumating, and she refused her last meal (she's been taking every 6 weeks or so and maintaining weight). However, I had her out for a few minutes today and she looks pretty good. Good body definition and shape and good color. Snapped a couple of pictures and thought I would share. Still sweet as always. Thank you Cletus. She's really a good girl too. Very sweet and fairly exploratory once she takes a few minutes to get out of "shy" mode when taken out. I can trust her with other people, even younger folks, when supervised, and she's a great Reptile Ambassador. 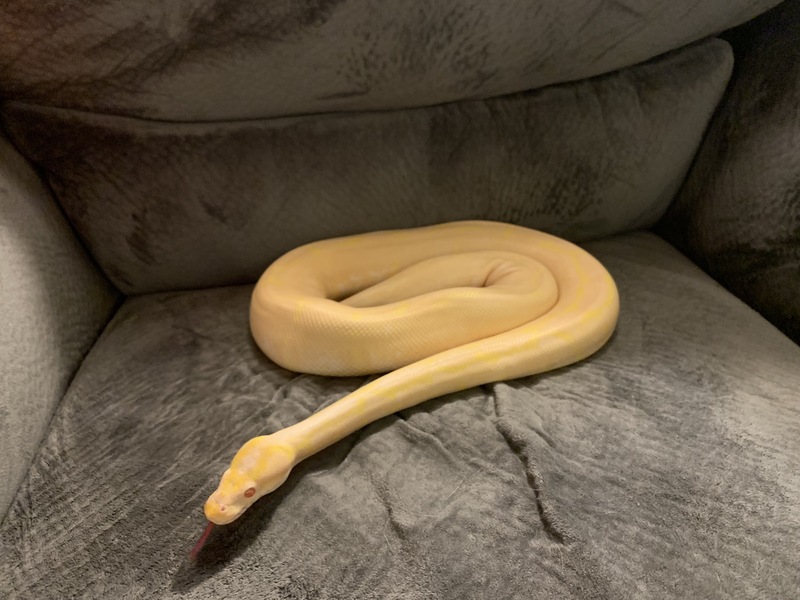 She got my niece Meghan (who just turned 8) into snakes (yellow is her favorite color as well) and they have grown up together. Now, Meghan loves all the reptiles and is writing book reports and researching different types of reptiles for school and on her own. Shayna also happily takes F/T, and although she fasts in the winter, eats well in the summer, and is healthy as can be at 6 1/2 years old. She is rather shy and reclusive in her tank, but then again, she's a BP. 95% of the time she doesn't even strike her food, but either takes off the tong, or begs me to put it down and she will drag her rat into her house and eat quietly by herself. Frankly, she scares the crap out of me when she does strike. It happens about 1X a year and I never know when it's coming. Shayna has refused for almost 2 months now (she ate last on 12-23-18). She was eating every 6 weeks, but refused the last two feedings (I offer every 3 when I offer Behira). I will offer again in 2 weeks (she skipped last week last), but she seems fine. 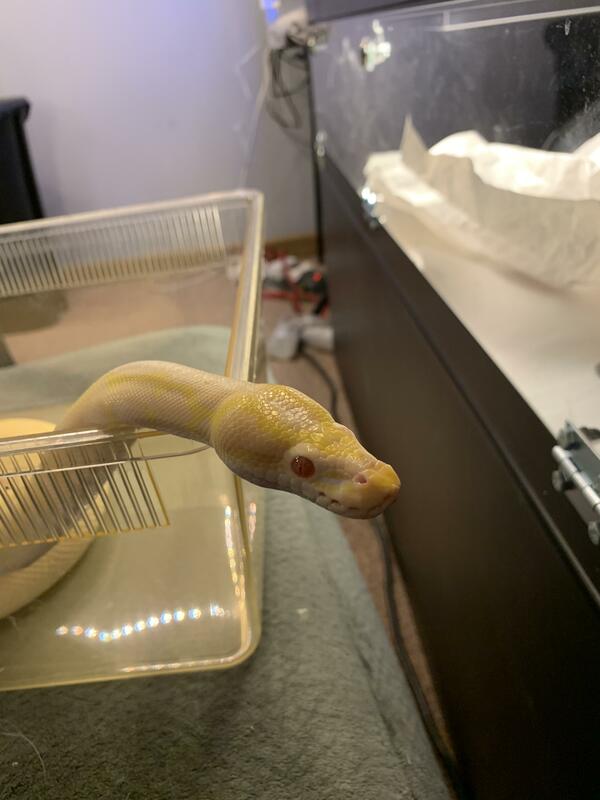 She's doing her normal brumating BP thing and staying hidden 99% of the time and not even exploring at night. She's lost a total of 40G to 1,730G from 1,770G when she started skipping meals. I am not concerned. Shayna shed two nights ago and I got pictures. She's looking good and is starting to get a little more active. I think she might actually eat tomorrow, but I am not selling the farm. Last edited by jmcrook; 02-24-2019 at 01:01 AM. Do the albinos have any of the unfortunate bad genes in them that cause involuntary movements? I think it's probably circumstantial and dependent on lines and breeding etc. Having said that, Shayna, who is Albino and Spider, shows almost zero Spider issues. 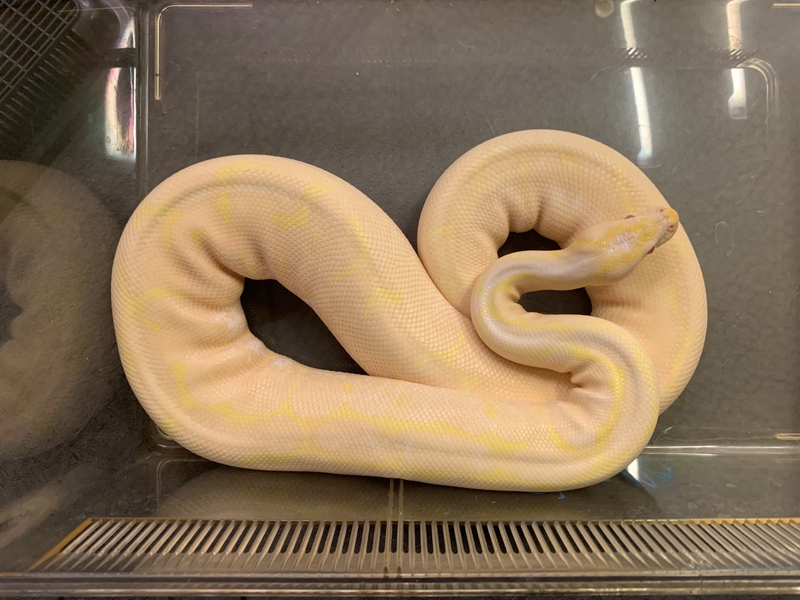 If 100% is full Spider neurological issues, and 0% is a normal albino, Shayna is probably around 10%. She eats great, moves great, and has no discernible wobble, 90% of the time, and occasionally, and slightly, if you look for it. If you didn't know what to look for, you would never notice it.